Look What Turned Up in My Hometown Book Store! I grew up in Poulsbo, Washington, the town just off the bridge from Bainbridge Island, where The Violets of March is set. The lovely book store there, Liberty Bay Books (just down the hill from the church I was married in!) has a nice display of Violets out, and my mom and dad (who live in Poulsbo) walked down today to snap some pictures. I am kind of loving that my book is right next to this year's Pulitzer winner. OMG! Too fun. If you ever are in this part of the country, pay a visit to Poulsbo, and stop into Liberty Bay Books and say hi. We popped in to book stores to check on The Violets of March, and of course, the boys had fun! Here is Colby, age 12 weeks, holding his mama's novel, above. And the older boys thought it was pretty cool, albeit a little weird, to see their mama's book next to Bob Barker's! Somebody Pinch Me. VIOLETS is a Costco Book Buyer Pick! The lovely book buyers at Costco picked The Violets of March as a favorite fiction pick for the month of May, which appeared in the Costco Connection magazine. Major ohmygosh moment over here. I am so flattered, honored, and excited that Costco shoppers will get to see the book. And, I don't know about you, but every time I'm at Costco, I make a beeline to the books section, which is always so well-stocked and so darn appealing! (Seriously, I always leave with a stack of books!) Here's the review that was printed in the Costco magazine (you can also see it here): "I've long believed that the right book finds you at the right time. From the moment I saw this book's jacket, I knew I had to read it. And I wasn't disappointed. Thirty-something Emily Wilson has lost the enviable life she had in her 20's,. At her aunt's request, Emily decides to spend the month of March on Bainbridge Island in Washington state. There she discovers an old diary that chronicles events that parallel her own life. The island becomes a place of healing for Emily--as I'm sure this book will become a source of healing and comfort for its readers." --Shana Rawers, assistant buyer, books I hope you'll look for The Violets of March next time you're at Costco! Snap a picture (and maybe toss one in your cart) for me please! I'm so excited to share that the rights to my second novel, The Bungalow, sold today to Heyne Verlag, my publisher in Germany (a division of Random House). Heyne is printing the German version of The Violets of March (click here to see the gorgeous cover they've put together! ), and I am so thrilled that they loved The Bungalow and have big plans to publish in Germany following my first book. Am I pinching myself? Yes I am! Violets comes out on Tuesday. Tuesday, friends! I am a ball of nerves. Someone teleport me a mug of chamomile tea---quick. UPDATE: My early giveaway copies have been spoken for! Wowza--those went fast. But, I just got a hold of 10 more. So, the offer still stands: Pre-order a book between NOW and the week of April 26 and I'll send a copy to the friend or family member of your choice! Just email me your receipt/proof of purchase--thanks!) Dear friends and readers: If you're thinking about ordering The Violets of March, will you think about snapping it up this week or next? I'm learning so much about this industry, but I'm told that the orders before the book comes out are very important for helping it make a big splash in its first month on the market. With that in mind, for the first 20 people who pre-order the book between now and the release date, April 26, I'll be sending an additional copy of the book to a person of your choice (think: friend, sister, mom, book club pal, person in need of cheering up!). Here's what to do: Just email me (sarah AT sarahjio DOT com) the "proof of purchase" (a scanned receipt, an email order confirmation from a bookseller like Amazon, Powell's or Barnes and Noble) that shows the purchase date between April 12 and April 26) and the name and address of the person you want your complimentary copy to be sent to. You know the old-fashion practice of putting flowers on people's doorsteps on May 1 (May Day)? Well, you can send a dear person in your life a literary flower instead with a copy of The Violets of March--my treat. Huge thanks, and happy reading! Aren't these photos gorgeous?! 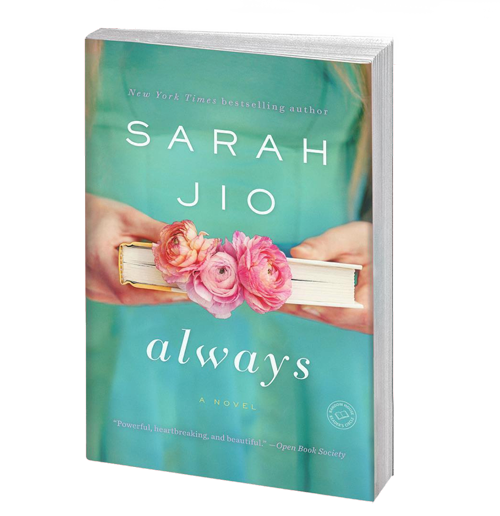 The lovely Tiffany over at Dancing Branflakes posted them in a review of my novel recently. I was so flattered by all the kind things she had to say. And I flipped out over these beautiful photos (and I need to know where she got that cute dress she's wearing!! ).